Recently, I got sent some Redken samples to try out on my hair. I've never really bought or used Redken on my hair before, I don't know why, it's just not a brand I tend to pick up off the shelf. However after using their Extreme Shampoo and Conditioner, I will start to use their products more often! 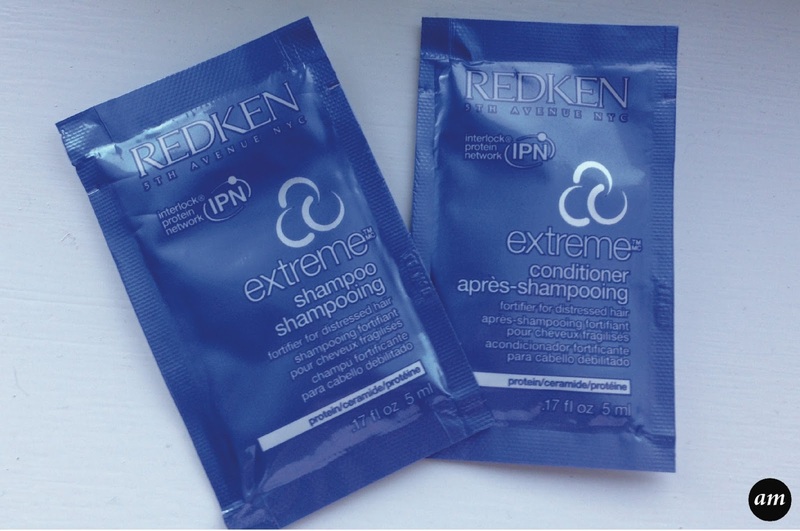 The Redken Extreme Shampoo and Conditioner is for dry and damaged hair. It is enriched with protein and reduces your hair breakage by 75%! The formula of the shampoo is designed to cleanse, strengthen and restore your weakened hair. The conditioner then adds moisture and helps to untangle your hair, preventing breakage. I only received a sample of the shampoo, but after just one use of both products, my hair felt lovely and soft. The ends of my hair looked healthier and it had a nice silky smooth appearance to it. I would defiantly buy more of the product and at just £8.49 for the shampoo (300ml) and £14.90 for the conditioner (250ml) how could you not? Shop Rush also have samples of both the shampoo and conditioner available on their website for free so you can try before you buy if you are still not 100% sure. All prices were correct at the time of writing the review.